Old favorites and surprise newcomers that are definitely worth your cheat day. 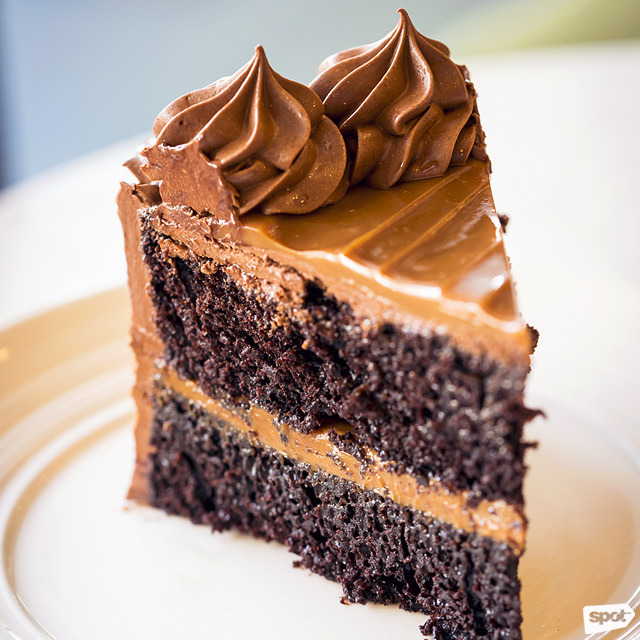 (SPOT.ph) Whether you go for the plain variety, want a smattering of gooey caramel in the middle, or are jonesing for a salty-sweet salted caramel hit, a serving of comforting chocolate cake can cure all life’s ills (at least for a moment). Get ready to satisfy your cravings with the city’s ultimate in chocolate decadence. 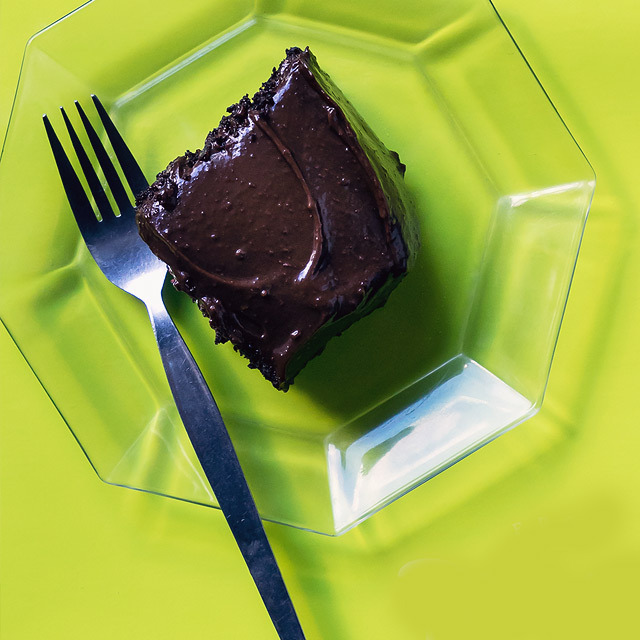 No classic compares to a slice of chocolate cake so for this list, we judged each based on its sweetness, texture, and overall flavor. Simple and straightforward, this crowd-pleaser is the perfect cake to bring to a reunion or a Sunday family lunch. When you want a plain chocolate cake that’s stripped of any fancy icing or complex toppers, this one does basic exactly right. One perk? You can have as big a slice as you want when treating yourself to this fudge cake because of its light texture and non-sugary icing. (That said, it may do you better to order a whole cake instead of just half!). Becky's Kitchen is at Suha Street, Valle Verde 1, Pasig City. 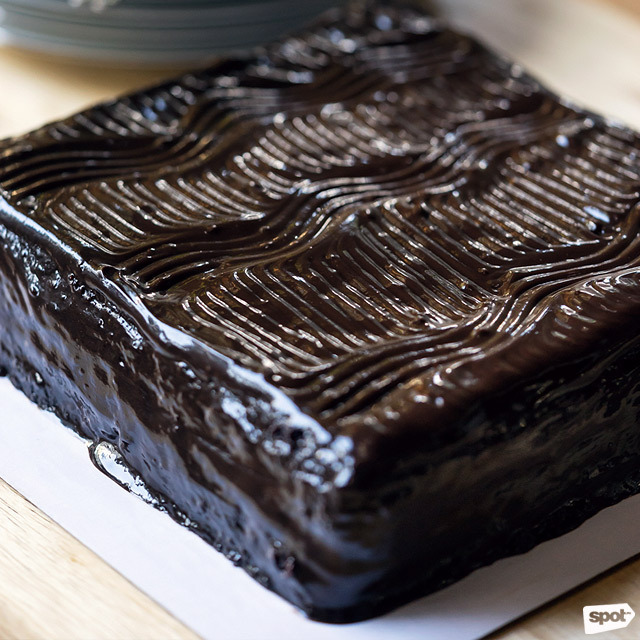 Formerly available for takeaway at the Magallanes Shell gas station and in Robinsons Galleria, this homemade cake is a yummy homage to the basic, no-frills chocolate cake. Think back to your first baking experiments in the kitchen—this was the ideal you aspired to create, with its soft cake and sugary icing. Caveat: For those who aren't from the South, it is quite the trek to make it to Merville and find the address. Make sure you do your Waze and Google Maps research before heading over. Polly's is at 16 Milan Street, Merville, Parañaque City. For more information, contact 824-7612. You can chug as many French hot chocolates as you want, but nothing will compare to the distinctly Pinoy taste of a tablea beverage. Now take that slightly bitter, thick, tsokolate eh flavor and turn it into a cake, and you’ll have Xocolat’s Salted Caramel Tablea Cake. 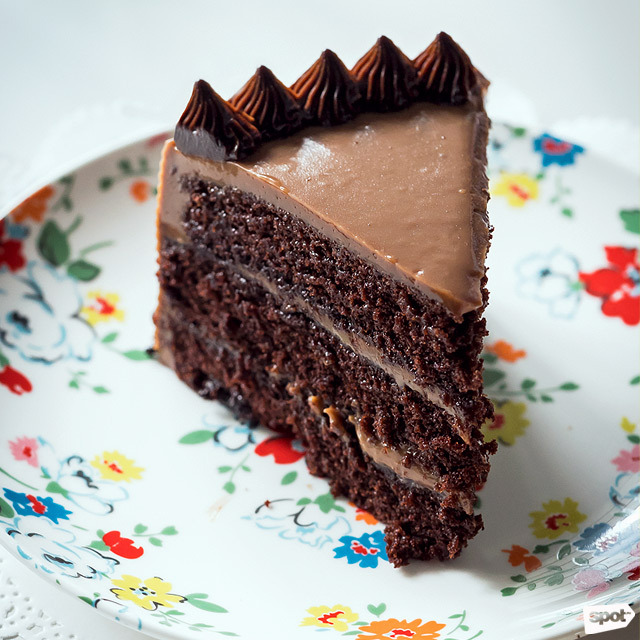 Great for those who want a taste of chocolate without a sugar rush, its combination of bittersweet chocolate and slightly sweet caramel is a perfect end-of-meal treat. See a list of Xocolat branches. If you’re a true-blue chocolate lover, you know that anything "truffle" ups the ante. Mary Grace’s Chocolate Truffle is decadent enough to tote with you on a special occasion, but light enough to leave you satisfied (without swearing off chocolate for the next couple of months). The Callebaut truffle they use has a lovely, smooth texture that is satisfying for both the older set and for kids, too. This is definitely a tita-approved cake. See a list of Mary Grace branches. 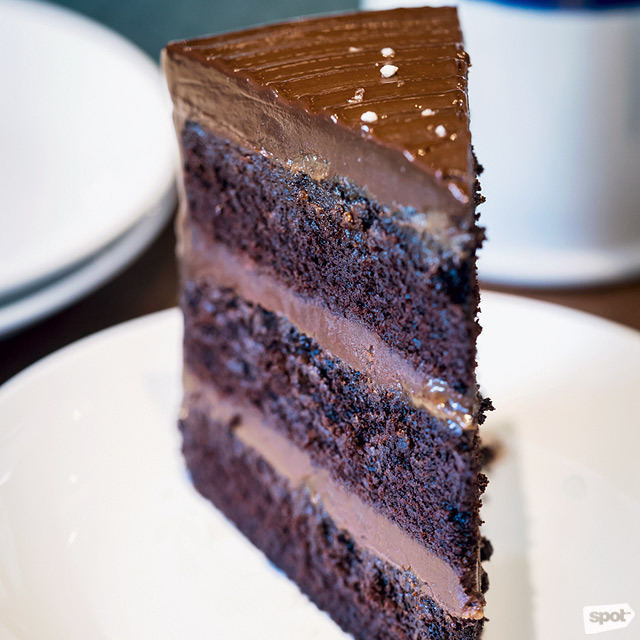 Mom & Tina’s Bakery Café has been a go-to for hearty and comforting fare for years—it’s only right that this restaurant’s Chocolate Fudge Cake is equally as heartwarming and soothing. With a rich and moist base, and a thick, solid layer of icing so fudgy you can almost chew on it, this cake is the stuff that childhood birthday parties are made of. If you’re feeling a little bit nostalgic for a classic, no-muss-no-fuss chocolate cake, this standard won’t disappoint. (Plus: If you’re watching the sugar, they offer a pretty good sugar-free cupcake option as well). See a list of Mom & Tina's Bakery Café branches. It’s no secret that Filipinos love all things sweet, and if you’re shamelessly looking for a superior boost of sweetness, this one’s the cake for you. Served tall and with an incredibly generous layer of fancy icing, this behemoth of a cake expertly hits the Filipino sweet spot. 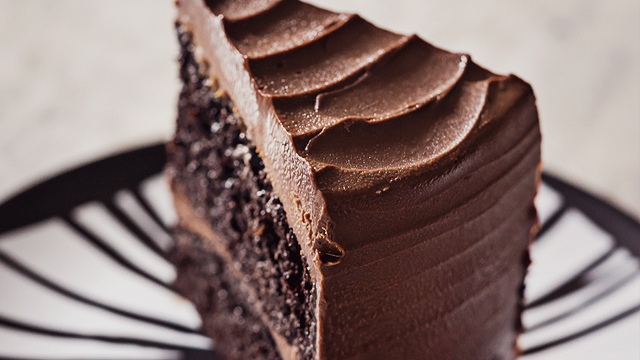 While the chocolate base is moist and delicious, it’s your run-of-the-mill chocolate cake. What turns Slice’s creation into something extra special is the introduction of silky sweet yema into the mix. Ask for a pitcher of water when ordering this one. 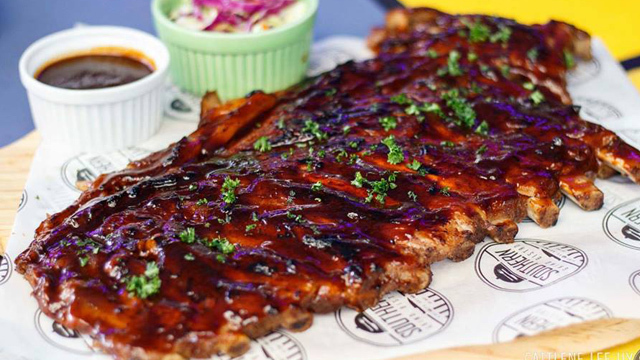 Slice is at 105 Bonifacio High Street, 7th Avenue, Bonifacio Global City. If you’re ready to head over to the dark side, Poco Deli’s slice of hardy, bitter chocolate will do you some good. Slathered with some of the softest, most delicate icing you’re ever going to try, this cake is dotted all over with tiny dollops of chocolate, giving it an extra texture that no other cake in town has. Perfect for fans of dark chocolate, Blackout also has a center layer of tender, sweet caramel that gives it some added oomph. See a list of Poco Deli branches. 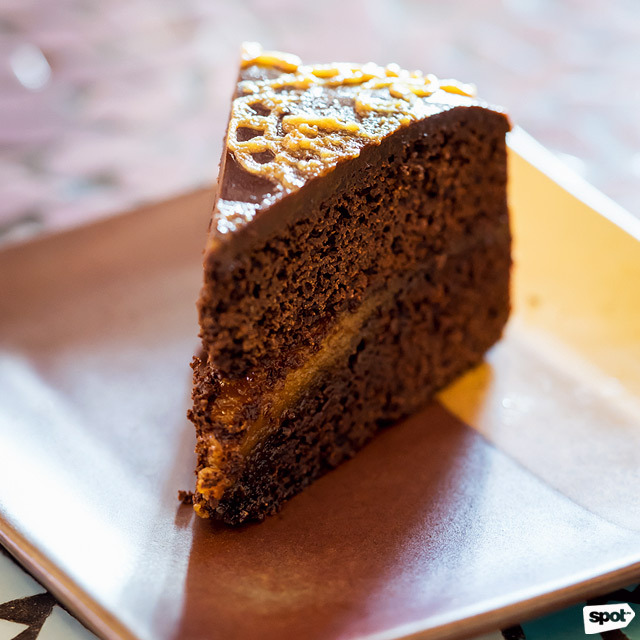 Named after the cake-eating fiend in Roald Dahl’s Matilda, Toby’s Estate's take on chocolate cake will certainly tempt anyone to go on a chocolate rampage. Striking the elusive balance between being dense but not heavy, the Bruce Bogtrotter is bold in flavor—a cake that is for serious chocolate lovers. Its bold flavor strikes the taste buds almost immediately after just one bite, showing you that this is one cake that means serious business. PS: Extra points for pairing this cake with one of Toby’s excellent coffee concoctions. See a list of Toby's Estate branches. 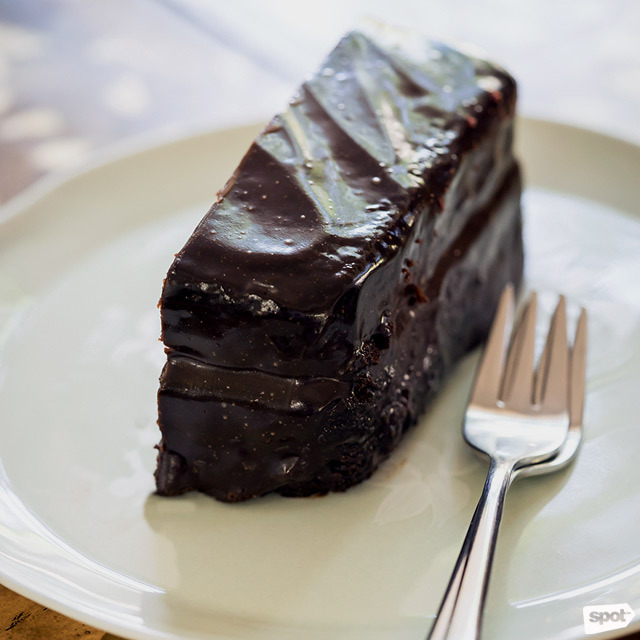 As soon as Dimpy’s Kitchen’s staff hands you over a box of their chocolate cake, you’ll know you’ve scored gold. This dense block of chocolate heaven will instantly make you the champion of any potluck party—a little goes a long way with this solid cake. Just a small serving can satisfy even the biggest craving. 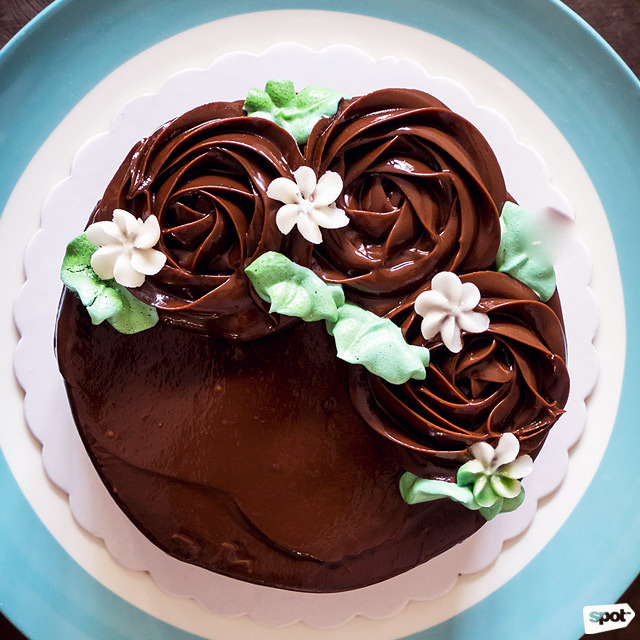 While Dimpy’s cake itself is moist and its texture is lovely, its killer icing is what will do you in. The rich and incredibly thick layer of chocolate goo will make you feel like you’ve voluntarily jumped into Willy Wonka’s chocolate river. Dimpy's Kitchen is at 1243 Acacia Street, Dasmariñas Village, Makati City. For more information, log on to Dimpy's Kitchen's website. 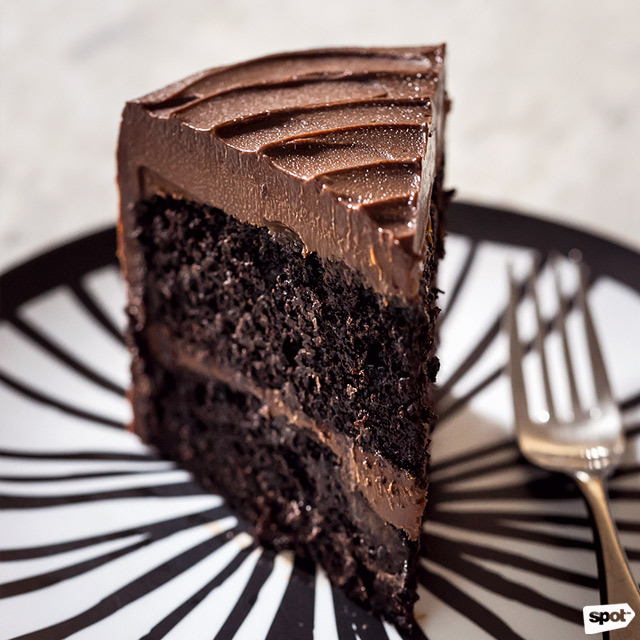 It might seem like a ridiculous idea to spend almost P300 on a single slice of cake, but when you see exactly how large Wildflour’s serving of salted chocolate cake is, you'll forgive the hefty price tag. 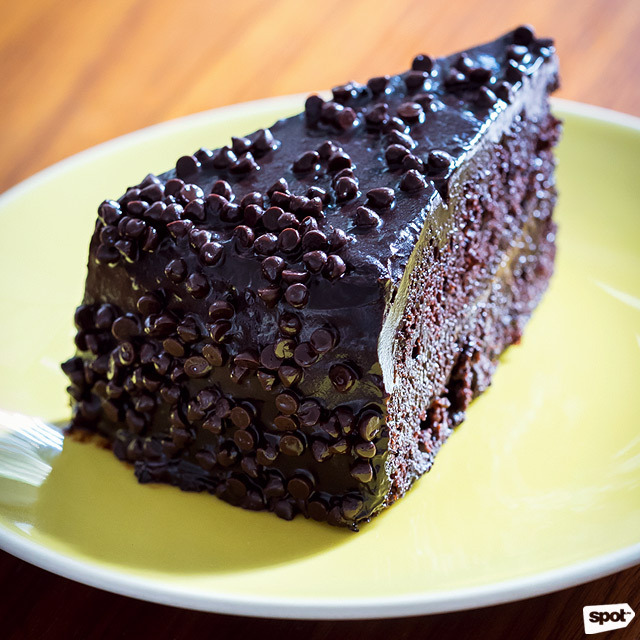 The dense and incredibly tall slice is worth all its weight in chocolate. Moist and thick with just the right amount of icing, it delivers an impressive balance between sweetness and saltiness. 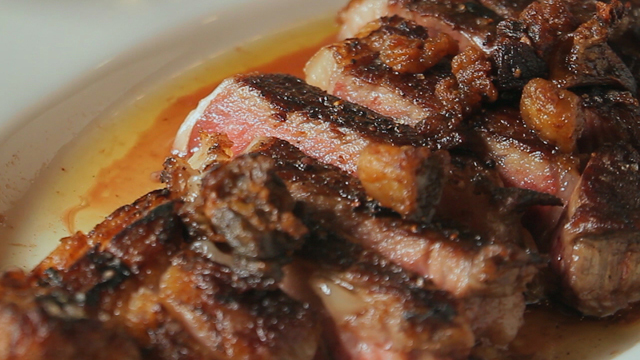 Get it to share, or take it home for a sinful midnight snack. You won’t regret this one. See a list of Wildflour Café + Bakery branches.